This article is about the goddess. For other uses, see Meenakshi (disambiguation). Meenakshi (also known as Meenatchi and Tadadakai), is a Hindu goddess and tutelary deity of Madurai who is considered an avatar of the Goddess Parvati. She is the divine consort of Sundareswarar, a form of Shiva. She finds mention in literatures as the princess or queen of the ancient Pandya kingdom who elevates to godhood. The goddess is also extolled by Adi Shankara as Shri Vidya. 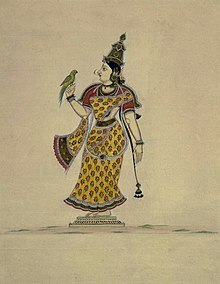 Painting of the goddess Meenakshi, depicted crowned, two-armed and with a green parrot perching on her right hand, circa 1820. She is mainly worshipped in South India where she has a major temple devoted to her known as the Meenakshi Temple in Madurai, Tamil Nadu. "Meenakshi" is a Sanskrit term meaning "fish-eyed", derived from the words mina ("fish") and akshi ("eyes"). She was earlier known by the Tamil name Tadadakai ("fish-eyed one"), mentioned in early historical account as a fierce, unmarried and meat-eating goddess which was later sanskritised as Meenakshi. She is also known by the Tamil name "Angayarkanni" or "Ankayarkannammai" (literally, "the mother with the beautiful fish eyes"). According to another theory, the name of the goddess literally means "rule of the fish", derived from the Tamil words meen (fish) and aatchi (rule). Various meanings of this appellation have been suggested, including that she was originally a goddess of the fisher-folk, that her eyes are "large and brilliant" like that of a fish, or that she has "long and slender" eyes shaped like the body of a fish. Another interpretation is that the name is based on the belief that the fish never close their eyes: the goddess similarly never stops watching over her devotees. Yet another interpretation states that the name is based on the ancient belief that the fish feed their young by merely looking at them; the goddess supposedly supports here devotees by merely glancing at them. Several great hymns on the goddess were composed in the early modern period by many saints and scholars, including the famous Neelakanta Dikshitar. The stotram Meenakshi Pancharatnam (Five Jewels of Meenakshi), composed by Adi Sankaracharya (8th century AD), is an incantation to her. Meenakshi does not directly appear in the stotram Lalita Sahasranama, though there is a reference to her in the line Vakthra lakshmi parivaha chalan meenabha lochana (She who has auspiciousness and glory of Lakshmi and has beautiful eyes which look like fish in the pond of her face). The great Shiva with the metel flower / Wanders through the courtyard of space / Destroying your work again and again / And then he comes before you. // You never get angry. / Every day you just pick up the vessels. The 13th century Tamil text Tiruvilaiyatarpuranam, mentions king Malayadhwaja Pandya and his wife Kanchanamalai who performed a yajna seeking a son for succession. Instead a daughter is born who is already 3 year old and has three breasts. Shiva intervenes and says that the parents should treat her like a son, and when she meets her husband, she will lose the third breast. They follow the advice. The girl grows up, the king crowns her as the successor and when she meets Shiva, his words come true, she takes her true form of Meenakshi. According to Harman, this may reflect the matrilineal traditions in South India and the regional belief that "penultimate [spiritual] powers rest with the women", gods listen to their spouse, and that the fate of kingdoms rest with the women. According to Susan Bayly, the reverence for Meenakshi is a part of the Hindu goddess tradition that integrates with the Dravidian Hindu society where the "woman is the lynchpin of the system" of social relationships. Her eyes are fabled to bring life to the unborn. The temple complex at Madurai, Tamil Nadu in India is dedicated to Meenakshi as the primary deity. It is also referred to as Meenakshi Amman or Minakshi-Sundareshwara Temple. Meenakshi's shrine is next to that of her consort Sundareswar, a form of Shiva. Though the temple has historic roots, most of the present campus structure was rebuilt after the 14th century CE, further repaired, renovated and expanded in the 17th century by Thirumalai Nayak. 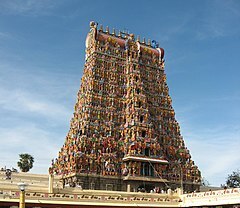 In early 14th century, the armies of Delhi Sultanate led by Muslim Commander Malik Kafur plundered the temple, looted it of its valuables and destroyed the Madurai temple town along with many other temple towns of South India. The contemporary temple is the result of rebuilding efforts started by the Vijayanagara Empire rulers who rebuilt the core and reopened the temple. In the 16th century, the temple complex was further expanded and fortified. The restored complex houses 14 gopurams (gateway towers), each above 45 metres (148 ft) in height. The complex has numerous sculpted pillared halls such as Ayirakkal (1,000 pillar hall), Kilikoondu-mandapam, Golu-mandapam and Pudu-mandapam. Its shrines are dedicated to Hindu deities and Shaivism scholars, with the vimanas above the garbhagrihas (sanctums) of Meenakshi and Sundaresvara guilded with gold. The temple is a major pilgrimage destination within the Shaivism tradition, dedicated to Meenakshi Devi and Shiva. However, the temple includes Vishnu in many narratives, sculptures and rituals as he is considered to be Meenakshi's brother. This has made this temple and Madurai as the "southern Mathura", one included in Vaishnava texts. The large temple complex is the most prominent landmark in Madurai and attracts tens of thousands visitors a day. The temple attracts over a million pilgrims and visitors during the annual 10-day Meenakshi Tirukalyanam festival, celebrated with much festivities and a ratha (chariot) procession during the Tamil month of Chittirai (overlaps with April–May in Georgian calendar, Chaitra in North India). ^ Menon, A. Sreedhara (1978). Cultural Heritage of Kerala: An Introduction. East-West Publications. p. 250. ^ Howes, Jennifer (2 September 2003). The Courts of Pre-Colonial South India: Material Culture and Kingship. Routledge. p. 27. ISBN 9781135789961. ^ a b Rajarajan, R.K.K. 2005. Minaksi or Sundaresvara: Who is the first principle? South Indian History Congress Annual Proceedings XXV, Madurai Kamaraj University, Madurai, pp. 551-553. ^ "Meenakshi Pancharatnam Lyrics – Meenatchi Pancha Ratnam". Hindu Devotional Blog. Retrieved 21 January 2018. ^ Fiedler, Amanda (2006). Where does Meenakshi take her turmeric bath? : a multiply-constructed religious history and deity in Tamilnadu. University of Wisconsin--Madison. p. 1. ^ a b Journal of Kerala Studies. 36. University of Kerala. 2009. p. 97. ^ Nelson, Louis P. (2006). American Sanctuary: Understanding Sacred Spaces. Indiana University Press. p. 121. ISBN 9780253218223. ^ a b William P. Harman (1992). The Sacred Marriage of a Hindu Goddess. Motilal Banarsidass. p. 24. ISBN 978-81-208-0810-2. ^ Proceedings of the First International Conference Seminar of Tamil Studies, Kuala Lumpur, Malaysia, April, 1966. International Association of Tamil Research. 1968. p. 543. ^ William Norman Brown (1978). "The Name of the Goddess Mīnākṣī "Fish-Eye"". India and Indology: Selected Articles. Motilal Banarsidass. pp. 84–86. OCLC 871468571. ^ Klaus K. Klostermaier (2014). A Concise Encyclopedia of Hinduism. Oneworld. p. 153. ISBN 978-1-78074-672-2. ^ Richman, Paula (1997). Extraordinary Child: Poems from a South Asian devotional genre. Honolulu: University of Hawai'i Press. ^ Susan Bayly (1989). Saints, Goddesses and Kings: Muslims and Christians in South Indian Society, 1700-1900. Cambridge University Press. pp. 29–30. ISBN 978-0-521-89103-5. ^ Vijaya Ramaswamy (2017). Historical Dictionary of the Tamils. Rowman & Littlefield Publishers. pp. 9–10, 103, 210, 363–364. ISBN 978-1-5381-0686-0. ^ King 2005, pp. 72-74. ^ Tara Boland-Crewe; David Lea (2003). The Territories and States of India. Routledge. p. 401. ISBN 1-135-35624-6. , Quote: "By the beginning of the 14th century south India was exposed to the depredations of Muslim raiders from the north, and even Madurai was destroyed in 1310, by Malik Kafur, briefly becoming the seat of a sultanate thereafter." ^ a b Christopher Fuller (2003). "Madurai". In George Michell (ed.). Temple Towns of Tamil Nadu. Marg. pp. 94–113. ISBN 978-81-85026-213. Datta, Amaresh (2005), The Encyclopaedia Of Indian Literature (Volume Two) (Devraj To Jyoti), Volume 2, New Delhi: Sahitya Akademi, ISBN 81-260-1194-7 . King, Anthony D. (2005), Buildings and Society: Essays on the Social Development of the Built Environment, Taylor & Francis e-library, ISBN 0-203-48075-9 . Kinsley, David (1998), Hindu goddesses: visions of the divine feminine in the Hindu religious tradition By David Kinsley, Delhi: The Regents of the University of California, ISBN 81-208-0394-9 . Knott, Kim (2000), Hinduism: A Very Short Introduction, Oxford: Oxford University Press, ISBN 0192853872 . Michell, George (1995), Architecture and art of southern India: Vijayanagara and, Volume 1, Issue 6, New York: Cambridge University Press, ISBN 0-521-44110-2 . Pal, Pratapaditya (1988), Indian Sculpture, Volume 2, Los Angeles: Museum Associates, Los Angeles County Museum of Art, ISBN 0-87587-129-1 . Smith, David (1996), The Dance of Siva: Religion, Art and Poetry in South India By David, United Kingdom: Press Syndicate of the University of Cambridge, ISBN 0-521-48234-8 . V.K., Subramanian (2003), Art shrines of ancient India, New Delhi: Abhinav Publications, ISBN 81-7017-431-7 . Wikimedia Commons has media related to Minakshi.